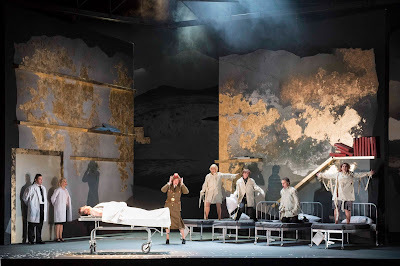 21st February 2016: After the mixture of frustrations and delights that characterised the previous evening’s “Marriage” it is piquantly ironic that “Divorce”, as portrayed in the world premiere of Elena Langer’s new opera, provided a considerably more dovetailed experience. This is not to say that the work itself is not without problems - Langer’s music is, unlike so many new works, comparatively easy on the ear but she often seems to be drawing heavily on Berg and Britten. Perhaps this is not so surprising in that she was writing for singers several of whom are indelibly linked to those composers’ operatic works. That cavil aside she is skilled in defining character through vocal line and her orchestral textures are exciting, often beautiful and happily maintain a balance with the vocals, ensuring that the singers are never swamped. The WNO orchestra, under the excellent Justin Brown, played with all the élan that they had shown under Koenigs in “Marriage”. Also of particular interest is the writing for the character of The Major which ranges from high mixed voice lines reminiscent of those twin Peters, Grimes and Quint through to the smoky insinuation of the Weimar period Kurt Weill. The production was far more visually satisfying than the previous night’s mess. 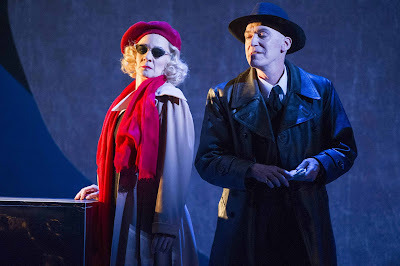 Whereas in “Marriage” Ralph Koltai’s sets had appeared unsuitable and tawdry, in “Divorce”, allied to a skilfully fluid production typical of David Pountney at his best, the huge panels smoothly defined the numerous locales and contributed to the louring atmosphere of a continent on the verge of collapse. The grey backcloth representing mountains fashioned from torn papers was particularly resonant. A word of praise for the two chorus members, Amanda Baldwin and Helen Jarmany acting as stage management who worked tirelessly throughout the evening moving the panels and furniture in increasingly complex formations. Many of the excellent singers from the “Marriage” were carried over into “Divorce”. Elizabeth Watts Countess is a first rate assumption. The role is a little under-featured in the first half but comes into its own in the more concentrated second half with her standing up to the reptilian Major in blazing tone and in the heartbreaking final scene left behind with her repentant husband to face their tragic destiny. Together Watts and Mark Stone’s excellent Count made this a highlight of the evening. Figaro and Susanna are a very different couple from their earlier incarnations. Their marriage, torn apart by suspicions and lies, they are characterised as tired and bitter only finding each other again as they combine to rescue the family from their pursuers. David Stout, who seemed marginally underpowered in the Mozart, gave a strong performance with ringing voice and detailed acting perfectly integrated. Marie Arnet’s Lulu-like Susanna sang her high-lying part with aplomb and her love-hate relationship with Andrew Watts embittered counter tenor Cherubino crackled with sexual tension. Watts’ sexually ambivalent night club owner is one of the more ifascinating deviations from the established characters and he dazzlingly negotiates a vocal line which ranges from high countertenor to baritone growl. Naomi O’Connell followed her febrile Cherubino with a gently determined Serafin (aptly he is later revealed to be Cherubino’s son by the Countess) and, together with Rhian Lois’ adorable Angelika, make an attractive pair of young lovers. But the most fascinating character is that of Alan Oke’s mesmeric, serpentine Major. In a role that deserves to stand alongside his Grimes and Aschenbach, Oke is simply riveting as an almost wholly repulsive character. His singing was little short of heroic especially when one remembers that he was indisposed the previous night. When so much new work seems likely to vanish into obscurity soon after their premieres “Figaro gets a divorce” deserves and, I predict, will have a bright future in opera houses.